Emeril Lagasse is widely known and loved for his years of cooking shows on The Food Network, Hallmark Channel and other networks. But did you know he cooked with Julia Child on PBS before that? Here are his thoughts about working with Julia, and her legacy to the food world. 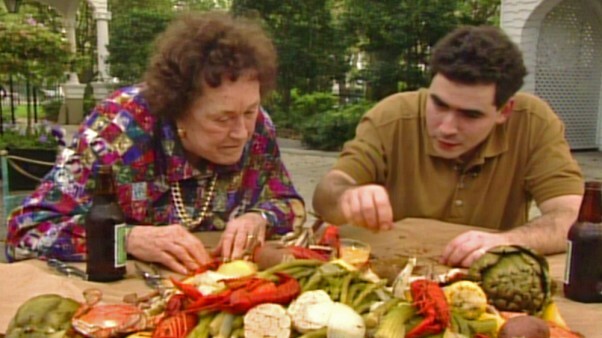 PBS: What was it like working with Julia Child? Emeril: Julia was my mentor. As my career evolved, I was fortunate to call her a friend. What was it like working with Julia? She was one of a kind, an incredible human being. PBS: What do you believe is Julia Child’s lasting legacy? Emeril: Teaching the American people French cooking and taking the intimidation factor out of it. PBS: What was the impact of appearing on In Julia’s Kitchen with Master Chefs? Video courtesy of Wine Spectator. 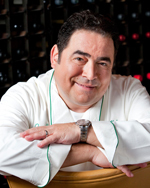 Chef Emeril Lagasse is the chef/proprietor of 13. His most recent opening was in Charlotte, NC with e2 Emeril’s Eatery. As a national TV personality, he has hosted over 2000 shows on the Food Network, and is the food correspondent for ABC’s “Good Morning America.” He is also the host of Fresh Food Fast and The Originals with Emeril both appearing on Cooking Channel. Lagasse is the best-selling author of 16 cookbooks including Emeril’s New New Orleans Cooking which introduced his creative take on Creole cuisine.